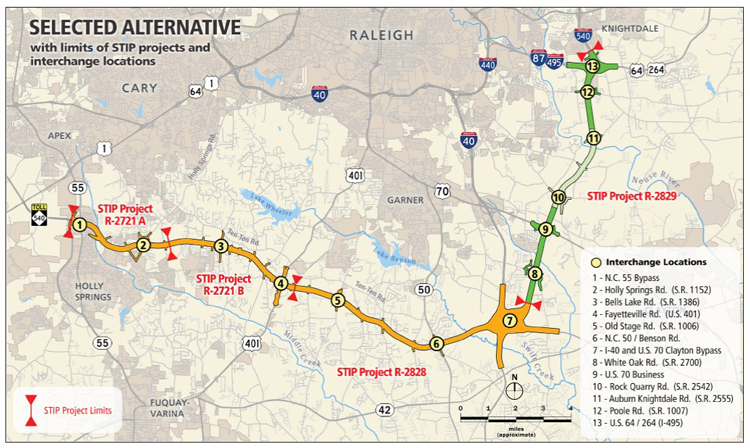 Raleigh, N.C. — The Record of Decision has been received from the Federal Highway Administration for the Triangle Expressway Southeast Extension (also known as Complete 540), signifying final federal approval of the project’s route. After years of studying various route alternatives, the Record of Decision confirms the orange-green-mint-green route as the selected alternative. This approval allows NCTA and the North Carolina Department of Transportation to move the project forward. The project will extend the existing Triangle Expressway from the N.C. 55 Bypass in Apex to U.S. 64 / U.S. 264 (I-495) in Knightdale. The Record of Decision allows NCTA and NCDOT to acquire land needed for the project’s right of way, obtain environmental permits and advance construction plans. The first of three construction contracts is now in the procurement process and the other two contracts will begin procurement later this year. The project’s first phase is anticipated to open in 2023. To view a copy of the Record of Decision, visit the project website at https://www.ncdot.gov/projects/complete540/Complete540EIS.html.